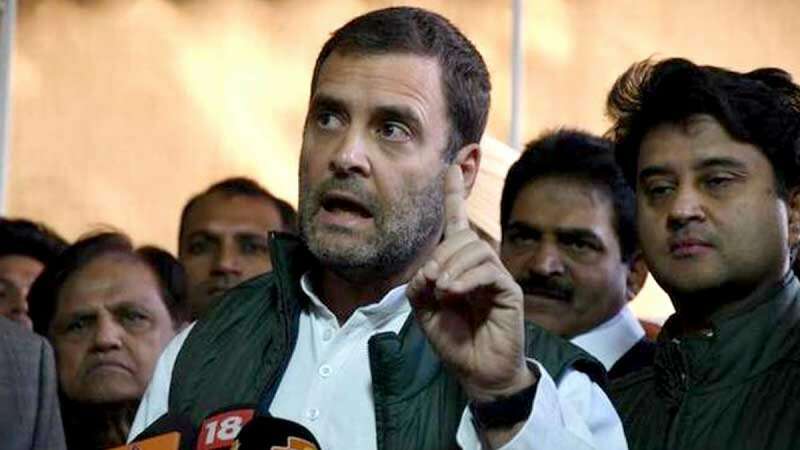 New Delhi : Congress President Rahul Gandhi on Wednesday vowed not to let Prime Minister Narendra Modi sleep till he waives off farmers loan across the nation. "I want to say that Congress and other opposition parties will together force Modi to waive farmers' debt. We will stand, fight, not budge an inch. We will not let him sleep at night till the time he waives the loan of farmers. I wanted to give you this message, tell this to the farmers," Rahul Gandhi said. "I want to tell the poor farmers that this is your country. It is not of 15-20 industrialists. Injustice is being meted out to you. You (farmers) work day and night and provide food to the country and your voice is never heard. We are ensuring that your voice is heard. We have done it in three states and you remember we will pressurise Narendra Modi ji to do it," he said during an interaction with the media in Parliament House complex. Boasting his victory in the recently concluded assembly elections, he claimed that Congress managed good votes because poor, farmers and small businessmen were not happy with Narendra Modi's policy. He said Modi in his over four years in office has not waived a single rupee of farmers' loans but had written off Rs 3.5 lakh crore loans of 15-20 big industrialists using people's money. Placing his bid for the Lok Sabha Polls, the Congress chief said that if PM Modi does not waive off farmers loan then his party will do it as soon as they come in power.